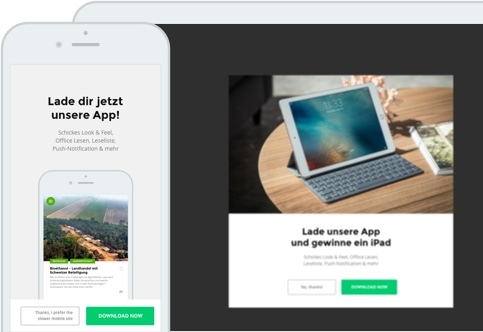 Nr.1 solution for building a mobile content app with your companies content. appful is a SaaS company focused on enterprise mobile apps. 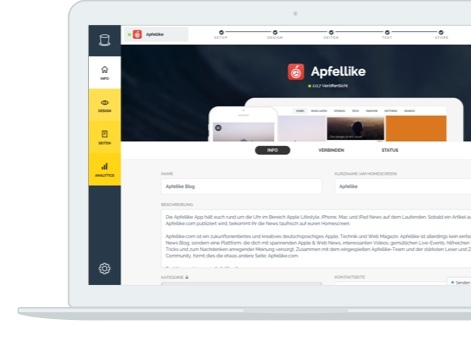 Our mission is to help companies, publishers & magazines to reach their customers, employees & users with their content - through one of the most powerful content channel: a mobile app. Over the last years one of the biggest shifts in the history of the internet took place: internet usage on mobile devices, such as smartphones and tablets, nowadays exceeds PC usage. Consumers use their mobile phones especially for accessing content informations, e.g. news from around the planet or ingredients for self-made pizza. In addition to that the usage of mobile browsers continuously shrikes. The vast majority of 80% of the time that smartphones are used, users use mobile apps instead of mobile websites. The reasons are obvious. A mobile app is faster and more convenient with a better look & feel. Moreover the publisher is able to directly reach his community through push notifications. with the appful. Join them! Our sophisticated system covers many use cases. Now it's your turn to realize your dreams and imaginations. Why should to you convert your WordPress blog content into a mobile App for iOS and Android? In particular, push notifications boost the active users in a mobile app. While a mobile site is forced to rely on users getting back to its content, a mobile app can be proactive and remind consumers about new content. Last but not least, users come back to a mobile app more often because of the better and faster interface. Good user experience thanks to excellent look & feel of a mobile app, don’t primarily “only” cause more app traffic and app impressions, additionally it could be the killer reason for the consumers to use your product instead of your competition. Our mobile app design are specifically optimized for a great user experience: User should be able to find easy and fast what he searches for in the mobile app. People may fall in love in your mobile app and the way you present your content on mobile. The far more easier and faster way to write comments through a native comment field in your mobile app will result in more exchange in your comment section. All of this will lead to a stronger connection between you and your community, customers or employees. So stop providing your content only on a “boring website” and start offering your content inside a beautiful mobile app to your target group. we work hand in hand with our customers. 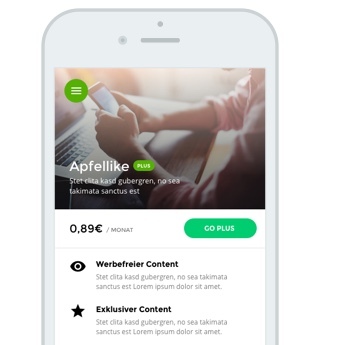 Together with our customers we build a couple of pretty useful and effective features for our WordPress plugin and of course for the mobile app. Cleverly placed banner enable you to directly transfer the user into the app and outline the app's advantages. Our powerful network enables you to instantly edit your app from all over the world. Refinance your content production through a sustainable, long-lasting and optional subscription model which grants the user access to exclusive content. WordPress to mobile App - How does it works? Compared to a lot of other WordPress App Builder, we offer a very simple process to convert WordPress to Anroid App or iOS App. Still it is very imporant to us to build the greatest, fastest and most beautiful Content Apps for our Customers. 1. Install our WordPress Plugin on your blog. In the WordPress Plugin Store you will find the appful Plugin and install it. Either through the WordPress Plugin or on our site create an Account, in order to start setting up your mobile App. Now configure design, pages and settings of your mobile app and than publish it or get in touch with us. "Form follows function". With our solution we offer the most important app features, which will help to make your mobile app a great success. Our sophisticated, redundant high-performance network acquires a real-time cache of your whole WordPress blog content in order to provide the best user-experience possible for your mobile app. Multiple servers balance the load and traffic generated by app users through our system and make sure that your WordPress blog will not experience any traffic peaks because of your content app. Therefore, your WordPress blog app will seamlessly integrate into your existing eco-system and lift the heavy load from your blog installation so you can focus on what is really important: Making an impact with content publishing. Adding to that, your readers or customers can enjoy the full power and speed of your native content app. Though mobile networks are constantly extended, we experience moments without or only slow mobile internet connection. In this situation reveals another useful feature in all our mobile apps: Offline reading. Beside the fact that our solution tries to intelligently save a lot of article the user might want to read, it is possible to do it manually. Simple save an article to the Read Later List in the mobile App. With this moment the post is saved offline on the mobile device until it is removed. Your community, customers or employees will thank you for this app feature. An elaborated native commenting system empowers you to integrate the best social interaction experience possible, right inside your mobile app on the user’s phone. Multiple solutions such as a native Disqus app integration or a native WordPress comment app integration make sure that users can interact and discuss with your whole community. We are no classic agency. We don't focus just one the comprehensive setup at the beginning. We are a WordPress mobile App Service Company. We provide our powerful value throughout the time the app is published and grows.